What is the Kepler Manager? The Kepler Manager allows you to interface with the Space-Track Web site to download two-line element data. 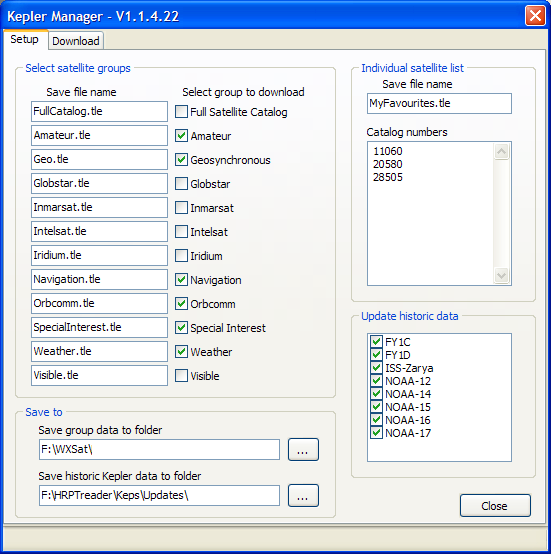 Additionally, with the registered version, you can also use the automation features of the Kepler Manager to keep your Kepler data up-to-date for both the multi-line Kepler data required by real-time tracking programs such as WXtrack and the historic Kepler data required by programs like SatSignal and the HRPT Reader for processing non real-time data. The Kepler Manager requires that you are a registered use of Space-Track Web site. Please visit that site to register - it's free! Can I register the Kepler Manager and what do I get? a new menu option in WXtrack (Tools, Kepler Manager) allows you to run the Kepler Manager from within WXtrack (requires WXtrack V3.4.8 or later). you can run the program with command-line a parameter -AUTO or -START to provide fully automated, hands-off updates of your Kepler data. Use the Windows scheduler to provide regular updates (e.g. twice a week). you can provide a list of your own favourite satellites to be retrieved in addition to the standard bulk catalogues. You won't have to request changes to the Space-Track site and wait for items to be added. the program can automatically update any multi-set historical data files that you have such as those used by my HRPT Reader program and other software. A Kepler Manager licence is included in the WXtrack licence. The Kepler Manager will provide data for any programs using the standard two-line element Kepler data - WXtrack does not need to be running - just licenced on the PC where the Kepler Manager is running to get these additional functions. One oddity I've noticed is that the individual satellite data - where you enter the catalogue numbers into the list - sometimes have more recent Kepler data than the combined lists. So, for example, if you want the most recent data for NOAA-18, enter its catalogue number (28654) into the list rather than just relying on it being present in the weather group. You must be running Windows XP SP2, Vista, or Windows-7/8 on a 500 MHz PC with 256 MB of memory or greater. Older Windows versions are unlikely to work and are not supported. V2.0.2 Support for new Space-Track Web format, warn on sets which don't exist or fail to download, add support for GlobStar, make beta URL point to main Web site and make new format checked by default, retrieve favourites in NORAD catalogue number order. V2.0.4 Make the new format Web site of Space-Track the default. V2.0.6 Increase the height of the Historic data list-box a little. V2.0.8 Allow control of timeout value (zero gives defaults, maximum is 180 seconds). Register WXtrack - access extra Kepler Manager features such as automation and custom satellite list and help support continued developments. Unfortunately, the Kepler data from Space-Track sometimes contains inconsistent, out-of-sequence orbit numbers which can confuse software including my own AVHRR Manager. Space-Track are also planning to move to a different Web interface standard which may not be supported by the Kepler Manager. If this is a problem for you, I suggest that you get the Kepler data direct from EUMETSAT for the satellites for which they disseminate data. The command script below from Thorsten Miglus updates your existing multi-date (historic) Kepler data with the latest data from EUMETSAT. Create a suitable directory (e.g. C:\Tools\Keplers) and copy your existing multi-date Keplers there. Create a new text file named, for example, GetEumetsatKeplerData.cmd, and copy the script below into that file. You will also need to install the Windows version of the Unix utility "wget" which can be found here. You will need to edit the script to suit your own configuration. After testing, you can add a call to this script to your nightly jobs, and copy the updated multi-date Kepler data to your desired locations (e.g. C:\Tools\SatSignal\HRPTreader\Keps\Updates). If you need help, ask in the SatSignal group - don't e-mail me! REM has discontinuities in the orbit numbers. REM Use folder names without space characters throughout! REM Enter the folder where wget.exe resides. REM Where the data lives on the EUMETSAT site. REM Enter your historic filenames with complete directory names. REM These are the temporary file names for the latest downloaded Keplers. I am most grateful to Thorsten for sharing this script.